Our cabin creek collection conveys a reclaimed wood vintage feel. Each piece is heavily distressed to create a one of a kind look. 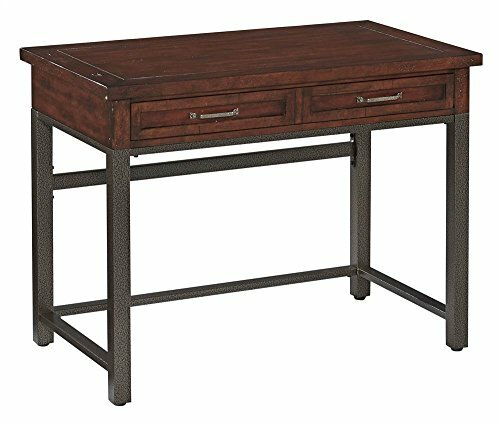 The cabin creek student desk by home styles is constructed of poplar solids and mahogany veneers in a multi-step chestnut finish. Distressing techniques include worm holes, fly specking, small indentations, and season splitting. Features include one drop-down front drawer with full-extension metal side guides that can be used as a keyboard tray. Accessorized by replicated hand forged hardware and hammered metal look finished legs. Finish and measurements may vary slightly. Assembly required. Size: 42w 24d 31.25h.